Deadman's Beach before the storm. All photos by Kerri Allen. 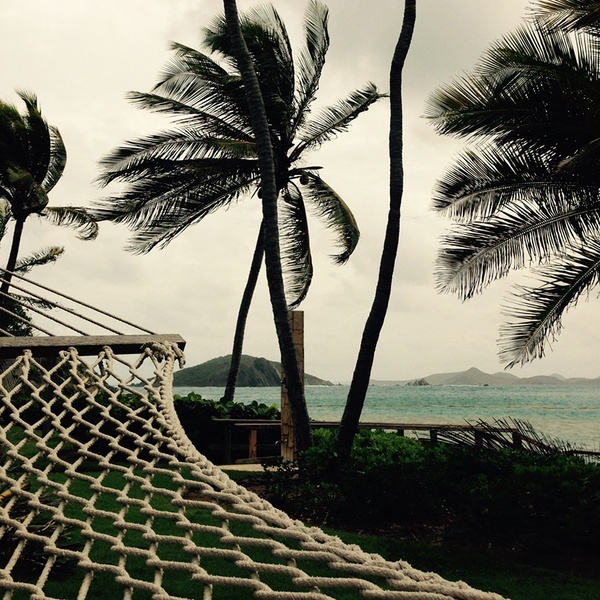 Kerri Allen finds herself in the middle of a hurricane at Deadman's Beach on Peter Island, a sandy stretch with a stormy history on an otherwise lovely private patch of the British Virgin Islands. 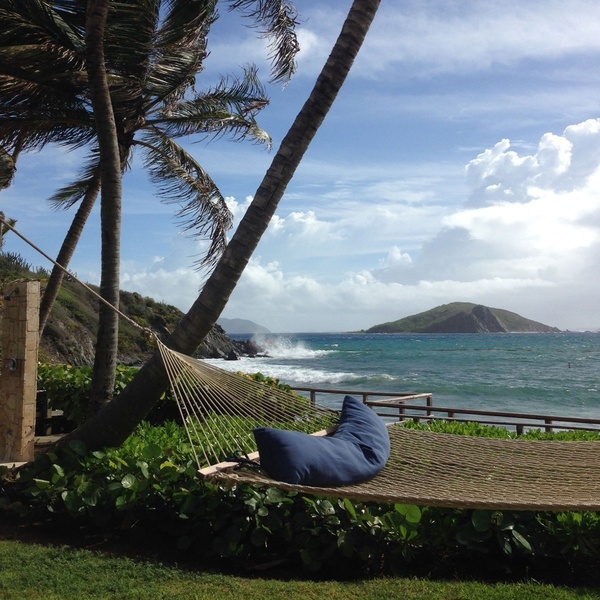 PETER ISLAND, British Virgin Islands – "I kind of like hurricanes," says Glenmore, as the wind begins to whip around locals and visitors alike on Peter Island, a three-square-mile speck in the Caribbean. "My mother needs water for her cistern." I'm not yet sure where I stand on the subject. At in the British Virgin Islands, the 14 guests of the island's only and very posh hotel are being herded to the Hawk's Nest, a structure built to withstand Level IV hurricane winds. Mercifully, the buzz is that the squall has been downgraded to tropical storm. I have my go bag just in case, and all of the island's alcohol has been locked away, should we guests need our wits about us. Peter Island Resort and Spa. 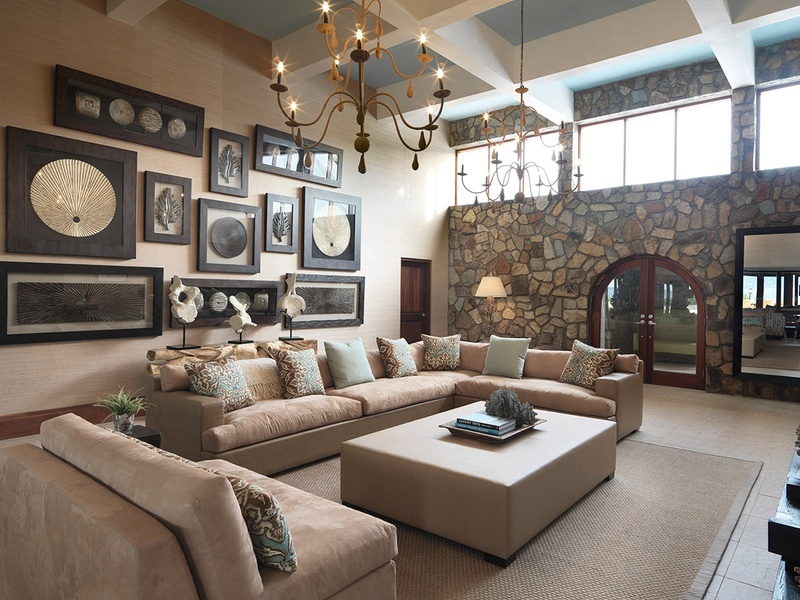 The living room at the Crow's Nest Villa. Photo courtesy of Peter Island Resort and Spa. Either way, local islanders like Glenmore are unfazed. The hills surrounding the multicolored Caribbean Sea are browning and need the rain. Cisterns are running dry. Peter Island and the entire British Virgin Islands have long been a place of tropical paradise for many and troublesome peril for others. Christopher Columbus landed and lived here and on surrounding islands during his second tour of the New World in 1493. Of course, Peter Island had no name in the 15th century. It was just a part of the newly-Christened Islas de 11 Mil Virgenes, Islands of 11,000 Virgins. The island was named for Peter Adriensen, a member of the Dutch West India Company who arrived at the azure shores about a century after Columbus. Today, the Van Andel family privately owns the land, making it the largest private island in the BVIs, whose seclusion and relative lack of tourism keeps it pristine. On the volcanic island's 1,800 acres, there is only one place for a traveler to rest her head today, and that's the Peter Island Resort & Spa. A few dozen humble A-frames dot the waters, with only 52 rooms available. It's truly a retreat not only from crowded cities but also from packed tropical destinations. But it was much less hospitable for many who came before. The name "Deadman's Beach" pretty much sums it up. One of the five island beaches takes its name from the bodies of pirates who had been marooned on neighboring Dead Chest Island, where Blackbeard ditched 30 of his men. Legend has it that the fifteen who survived inspired the sea shanty line, "fifteen men on a Dead Man's Chest, yo-ho-ho and a bottle of rum." And here we were — with the skies darkening and the palm trees bending in the gusts — and I desperately did not want to find myself anywhere near Deadman's. Alas, that was where I would be quarantined for the next seventeen hours. Without any rum. With the storm approaching around two o'clock in the afternoon, the fourteen of us on the island that night were instructed to go to our rooms and stay there until at least seven the next morning. My room opened directly onto Deadman's Beach, a bit of irony that Robert Louis Stevenson himself couldn't have whipped up. As night fell and waves slapped Deadman's white sands, I wrapped myself tight in an orange chamois blanket and dug into Treasure Island. "If sailor tales to sailor tunes / storm and adventure, heat and cold…"
Though land-bound and in bed, I felt seasick. The waves going in and out, insistent and angry all night, the wind howling through the palm leaves and commanding them to the hard, wet sands. This is the blustery Caribbean after all, and that's part of the gamble when you travel here in the middle of hurricane season. The next morning, I awoke to a new world. 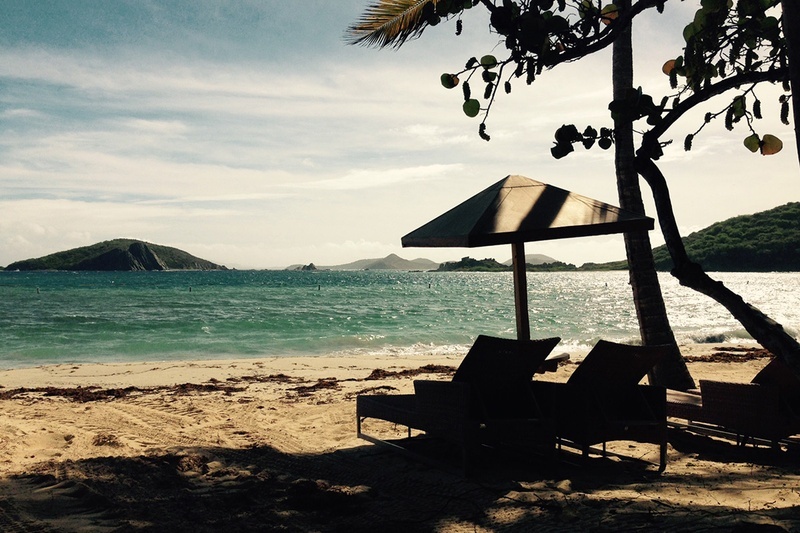 The sun shone on the palm trees and the calm sea, making it clear that Peter Island and its only resort are spectacular. This is the kind of place where you can truly unplug and go back to nature in its many forms. If you don't have a helicopter or private yacht (though both manners of entry are permitted to the island), you‘ll need to get to Tortola first. The will bring you to the island. Once you're on-island, you can walk wherever you'd like, but a complimentary shuttle service is available 24/7. 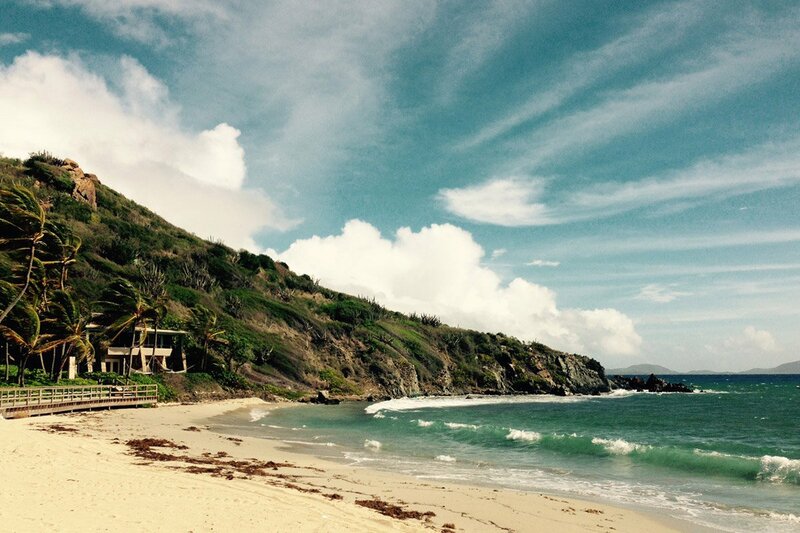 When the seas are calm, indulge in Peter Island's private beach dining service. A table with candles, wine, and a full spread will be brought to any one of the island's five beaches. In additional to the private dining, options are Tradewinds restaurant, where the breakfast buffet includes coconut-crusted French toast (ask for tamarind syrup), and Deadman's Beach Bar & Grill on the water, where Caribbean prawn cakes and fresh wahoo are on offer. Hurricane season in the BVI runs from June to November, roughly half of the year. The best time to visit is December through April, but, of course, that's high season when prices skyrocket. Try May for good weather and prices or tempt the cusp of the hurricane season months. Just keep an eye on the forecast. 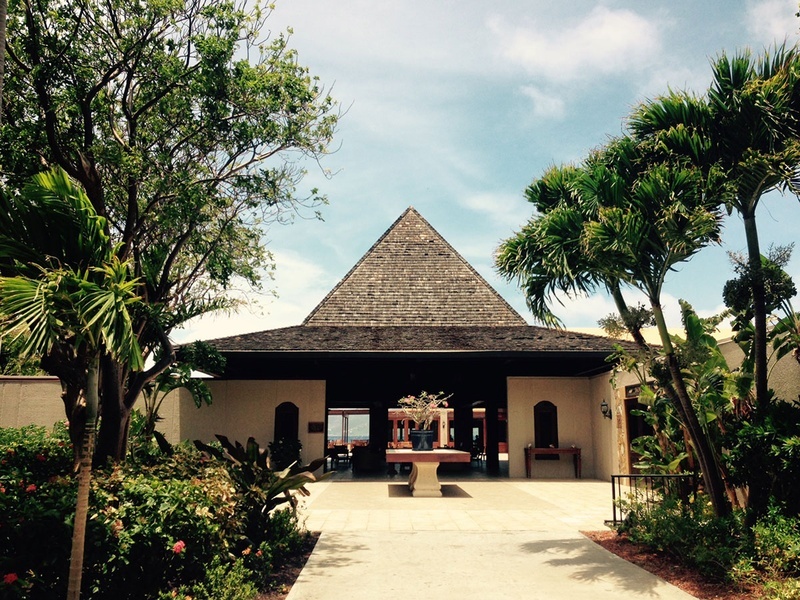 Peter Island Resort & Spa has fantastic service and the staff certainly deserve tips. Official BVI currency is the U.S. dollar. The resort's dress code is technically resort casual, but anything that's not too spring break-y goes. The staff aims to cater to all guest needs, but this is an island, so bring whatever you can't get by running out to the store. Eco-friendly sunblock is on-trend and rightfully so. You'll need a lot of it and will want to keep this paradise and its flora and fauna safe. by Robert Louis Stevenson was allegedly set on Peter Island and nearby Norman Island. will set the scene. is a Brooklyn-based travel writer. You can follow her on and . She travels for the bragging rights.